Challenge coins capture the very essence of military and first responder affiliation and instill pride to those that carry them. Many readers may not even know what a “challenge coin” is, or how they are used within the modern-day military ranks, but their use is highly prevalent in many arenas. Members of the US Armed Forces, Law Enforcement, and Firefighters have a long-standing tradition of carrying such coins that symbolize unit identity and brotherhood. Each piece usually bears unique unit symbols or mottos that identify the group in which they represent, and are often traded, presented, and collected between unit members. Depending on who you ask, the “challenge coin” has historical roots dating back from fifty to nearly one-hundred years. The most documented and familiar story about these coins comes from an American fighter pilot who was shot down during World War I and forced to land in hostile German territory. The pilot was subsequently captured and temporarily held in a detention facility that was later attacked by British Forces. This attack afforded the American an opportunity to later escape. At some point after his escape, and without many of his personal belongings with him, the American was confronted by French soldiers who detained him. He was presumed to be a German at the time, which led the French to nearly take his life. The American plead with the French Officer that he was indeed an ally, and presented a challenge coin he had received from his Lieutenant some time before being deployed. The coin was struck with the American’s Unit insignia and other identifying marks. The French Officer immediately recognized the insignia on the coin and postponed any plans to take the American’s life until his identity was validated. Later, the pilot was released, and the legend has it that the challenge coin presented to his would-be French executioner saved his life. Today, the popularity of the challenge coin has evolved into more than just a mark of representation for military personnel. They are actively traded among active-duty, retired, and civilian personnel within government agencies and political offices. The coin has also become customary to present to dignitaries and special guests to certain locations as a sign of “welcome” and respect. Presidents William Clinton, George W. Bush, Barack Obama, Donald Trump have minted challenge coins to present to White House guests and diplomats of foreign countries. The tradition has expanded to other countries as well, to include Canada, the United Kingdom, and Australia. 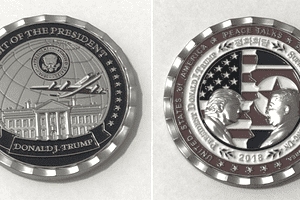 Most recently, President Trump released a challenge coin ahead of the North Korean and United States Nuclear Summit in Singapore in 2018. Over the years, military coins have evolved from seemingly simple designs to more complex and colorful varieties. This can mainly be attributed to the advances in manufacturing techniques that have been perfected over the years. One of the earliest challenge coins known to exist was a simple, die struck brass coin with a faint emblem and barely discernible text. Modern coins are manufactured in a fashion that allows each to display 3-dimensional images that rival the detail found on actual currency. Virtually every element of a custom coin now can be tailored to suit individual preferences. Some of the more popular features of challenge coins made in the last ten years include numbering, specialty edging, and photographic inserts, which allow and actual picture to be affixed to one or both sides of a coin. Throughout the career of an armed services member, he or she will have the potential to encounter and receive a substantial number of challenge coins. For example, the United States Air Force holds a coin ceremony for its cadets upon graduation, and for many Airmen, this is the first of many they will hold dear during their service term. Major news agencies have recently covered the presentation of challenge coins by high ranking officials to war heroes upon their return from duty in Iraq and Afghanistan. Such media awareness has helped to create an increasing popularity of these coins in venues beyond the military as well. Law Enforcement and Firefighter organizations have followed suit by distributing challenge coins to their staff for recognition and achievement purposes. Many have recognized that a small, personalized token can build unity among a team, which also promotes morale along the way. Not everyone in the government likes the idea of the challenge coin. The current Secretary of Defense James Mattis recently stated, “I’m saving money for bombs" when asked if he carried challenge coins to hand to the troops. There is no doubt that challenge coins have a significant and deep-seated role within many first responder organizations, both here in the United States and abroad. It has been said that only those who have served and received a coin for certain accomplishments will truly appreciate their meaning, but along the way it is clear that this closely held tradition has evolved and expanded outside the military, police and fire fighting communities. In fact, many corporations and small businesses that tend to do business with military, police, and fire fighters will also make coins. What Is an operational environment? What's the Policy Concerning LGBTQ People in the U.S. Military?